Weather – Getting cooler, but mostly great sunshine with highs in the mid-80’s and nights are in the mid-70’s. Getting breezier, especially the mornings and late afternoons. Fishing – If the conditions are right, there’s still blue-water species around like dorado, tuna, billfish and wahoo. Wow! 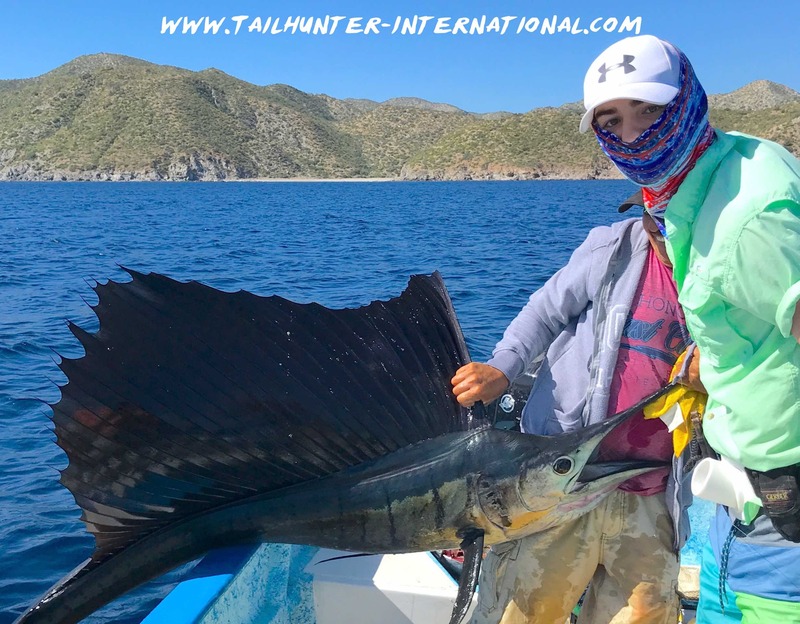 Right in Muertos Bay, a November sailfish after a season of very few sailfish, young Miles Wagner, got caught and released this sail not far from his dad’s place at Rancho Costa there in the bay. She just caught and released as striped marlin, but brought this nice fat yellowfin tuna back for dinner, Lisee Ferguson from Colorado Springs CO had a nice week of fishing. She’s there on the beach at Muertos Bay. Not bad for one day of winter fishing for Peter Wiejaczka who got 4 similar dorado plus lost a wahoo. Da head fella! 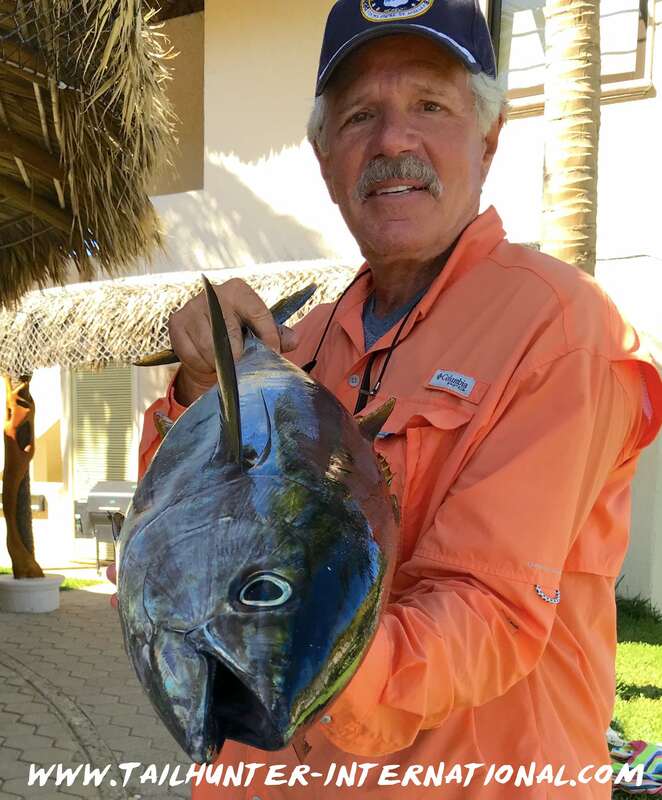 It’s Gary Wagner with a yellowfin tuna no doubt to get ready for the dinner menu at his great place in Muertos Bay, Rancho Costa Resort. LATE SEASON BLUE WATER SPECIES STILL HANGING IN THERE! Hope everyone had a spectacular, safe and happy Thanksgiving week! Still surprisingly OK fishing for blue-water pelagic species right now given how late in the season it is. It’s a simple formula. If the winds are blowing and it’s rough…as can be the case this time of year…it’s gonna be tough to fish. Or impossible. Or dangerous. If the weather is cooperating, then there’s still some tuna, dorado, wahoo and billfish to be had. The biggest issue on those days, might be getting live bait. With the turbulent waters, it crashes on areas where the live bait is often holding which scatters the baits. With this happening every few days, it makes it hard to find the bait when the waters are calm and we have folks out fishing. So, often we’re using dead bait like squid or frozen baits…which seem to work OK. Weather is nice, if you’re not out on the water and just coming to hang on the beach. It’s what a lot of folks are doing these days. Mostly a lot of snowbirds coming to enjoy the 80 degrees sunshine. 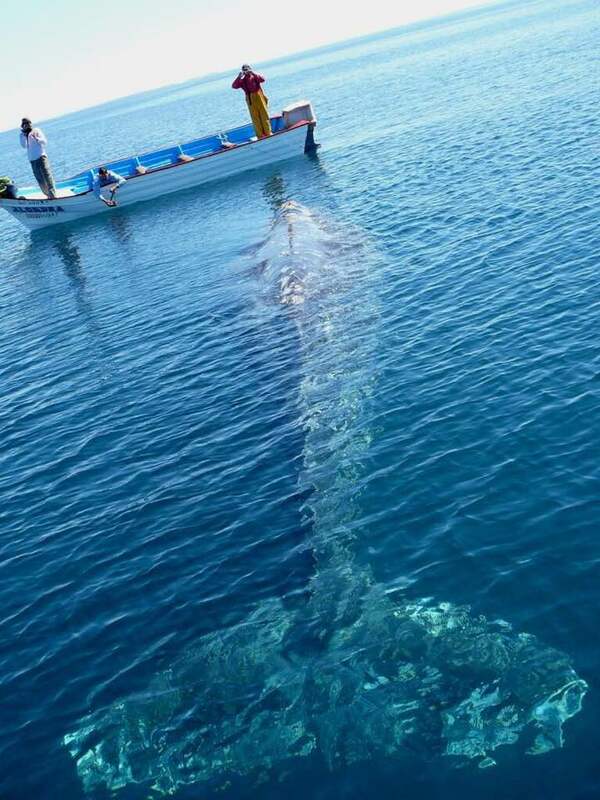 WHALE WATCHING SEASON COMING UP! Meet and greet time by the local visitors! Whalewatching season kicks off in January and will extend through March. 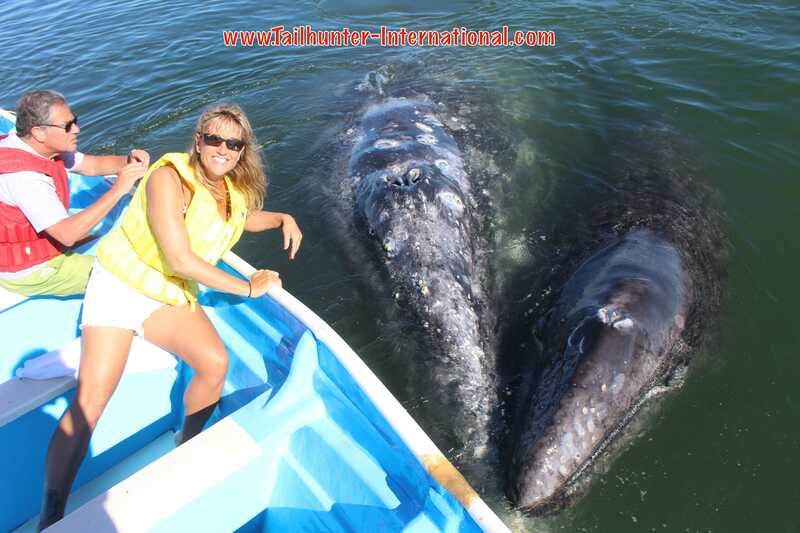 Best time is February as prime time to get close to these awesome creatures in the calm waters of Bahia Magdalena. It’s a fantastic trip for the entire family and not to be missed. Let us know and we can set up a trip of a lifetime. We can put entire packages together. NOT TOO EARLY FOR 2018 SEASON RESERVATIONS! Lots of ice chests full of fish went home last season after a great year in 2017. Lots of spots already filling for 2018. Don’t miss out! Check with us! 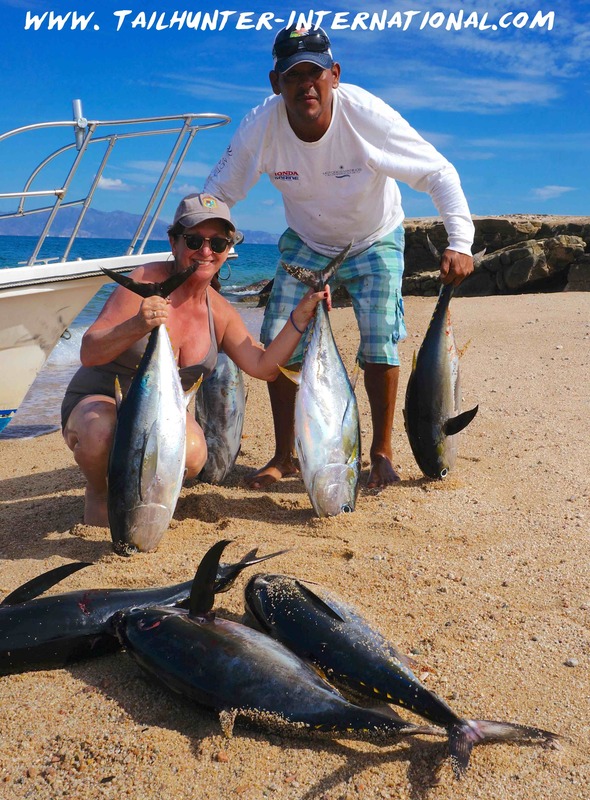 It’s not too early to be thinking about your 2018 La Paz fishing trip to visit us! After an incredible 2017 that saw some of the best fishing in years, alot of our anglers went right home and started booking for next year to get their favorite captains and hotel rooms. Let us know what we can do to set up YOUR 2018 La Paz adventure and we’ll set up the whole package for you. 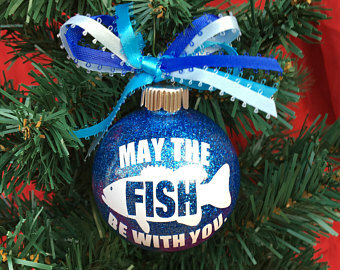 Also, La Paz fishing trips make great gifts too! Contact us and we’ll put a package together and a gift certificate too! I’m sorry…I gotta skip this week. After almost 10 straight months of 16-20 hour days, my voice is shot and so is my brain! I’ll give a round up next week! Oh…and my video camera is on the blink too! Thanks for understanding! Happy Thanksgiving everyone! Weather – Can’t really ask for more pleasant weather. Love this time of year. Daytime high 80’s. Nights are high 60’s low 70’s. Really pleasant time to be in town. Lots of sunshine which is why all the snowbirds are flocking back to town and tourists are escaping colder climes. Fishing – Not bad if the winds aren’t blowing. 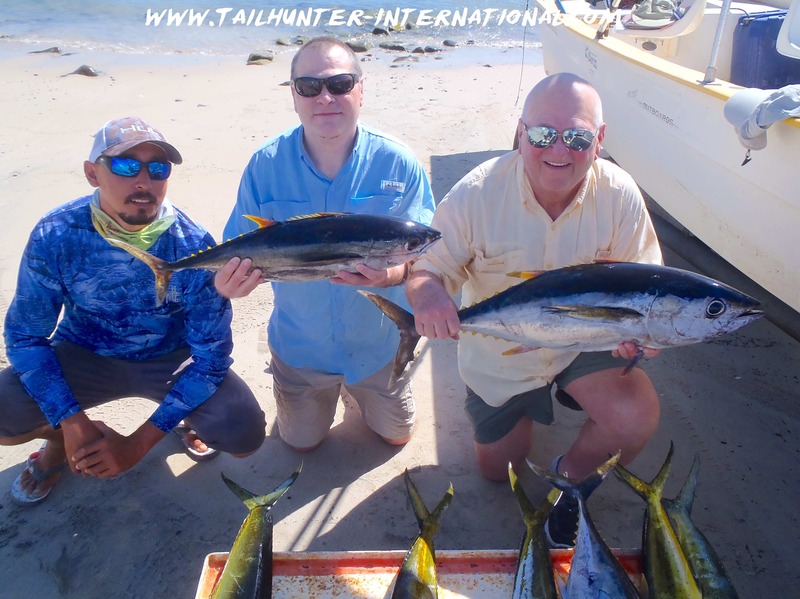 Cary McDermott from Las Vegas squeezed in one day of fishing with his buddies, Mike Devine and Jim Stephenson with Captain Armando and picked one day when the winds were down and got one yellowfin and a 1/2 dozen dorado between 8-16 pounds. Nicely done! Happy Thanksgiving everyone. Hope you have a safe, happy and peaceful holiday week! Gracias a Dios! 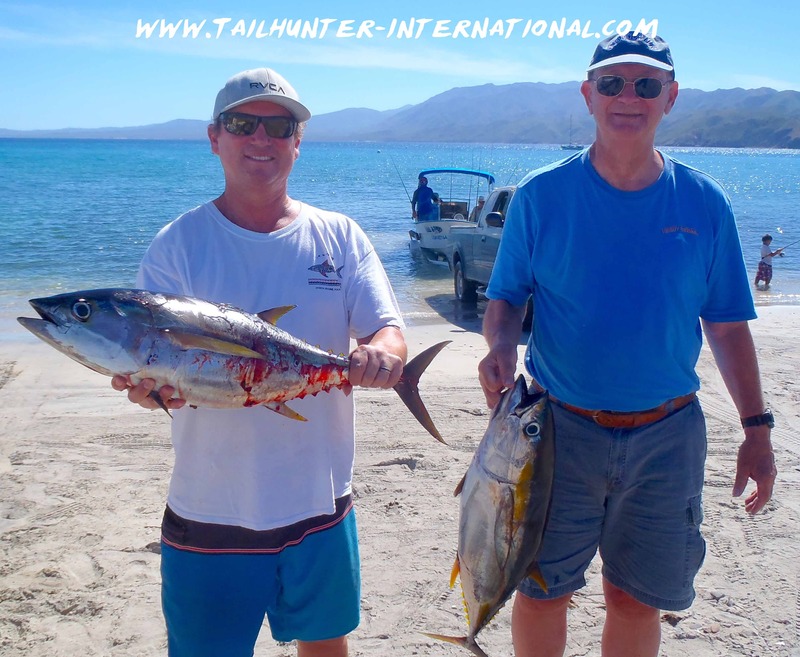 Mostly a lot of snow-birds coming to town now and not so many vacationers/ fishermen although this past week we had a full-house in La Paz with the Baja 1000 coming to town and a lot of fun. However, the majority of visitors now aren’t coming to fish. Maybe a day-or-two. Like I said, many are snowbirds visiting from colder places, not coming specifically to La Paz because it’s a fishing destination . They’re coming because even though it’s “winter”, it’s still a great sunny place to hang out in 80 degree temperatures! But, just as well, because from November to April or so, is our off-season and north winds are already blowing stronger and stronger making it less than stellar conditions to be out on the water. Great to watch from a beachside cafe eating tacos and beer or with your toes in the sand, but there are days when even our tranquil little La Paz Bay is a cauldron of white-caps splashing spray on cars passing on the waterfront. Even when the wind isn’t blowing especially hard, it’s blowing down the entire Sea of Cortez and it generates some big waves and swell. Large enough that either it’s simply too rough to be out there or impossible to get out and off the beach. We’ve already suspended our Tailhunter La Paz Fleet fishing for the season because of the erratic weather so we’re fishing only with our Tailhunter Las Arenas Fleet out’ve Muertos Bay where the bay faces south and we can launch right off the beach and, if it is especially rough, we can fish closer to shore. 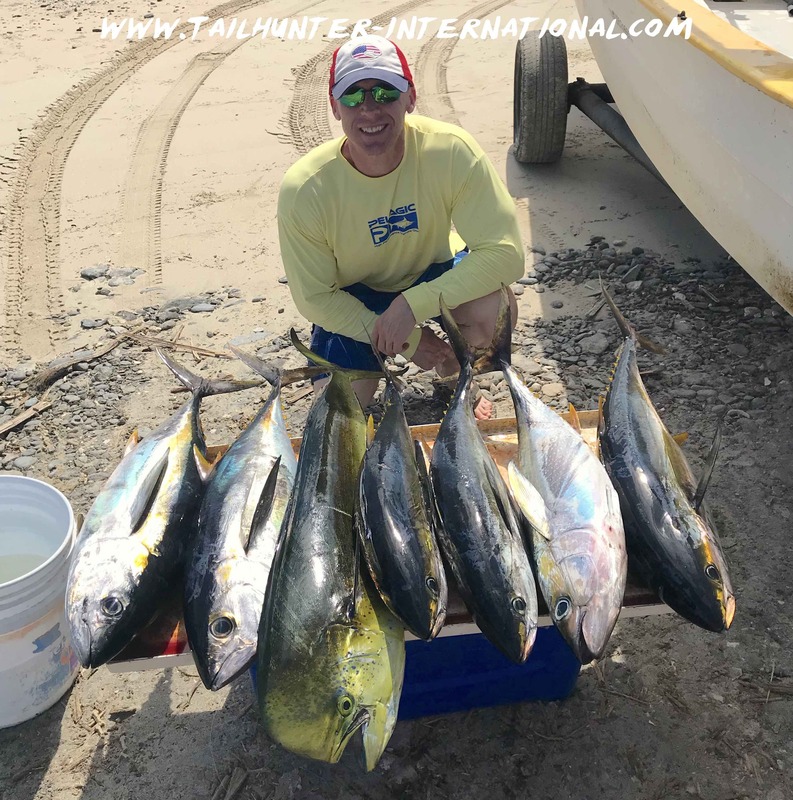 Earlier this week, it was pretty windy out there and fortunately, no one wanted to fish, but later in the week, we got some folks out and surprisingly, for this late in the year, we still hung some nice football tuna of about 10-15 pounds and good numbers of dorado. There were also bonito, cabrilla and some sierra, so a nice variety and good action, especially since these were folks who were visiting town and really only had one day to go out on the water. The fish weren’t too far off the beach, so no long boat rides even though there was some swell. This coming week, it looks like early in the week, we’ll have a carbon-copy of last week with the windier days early in the week and better conditions later from Thanksgiving Thursday on. Time to start checking the calendar for whale watching season coming up. Best times are late January to early March. February is perfect! 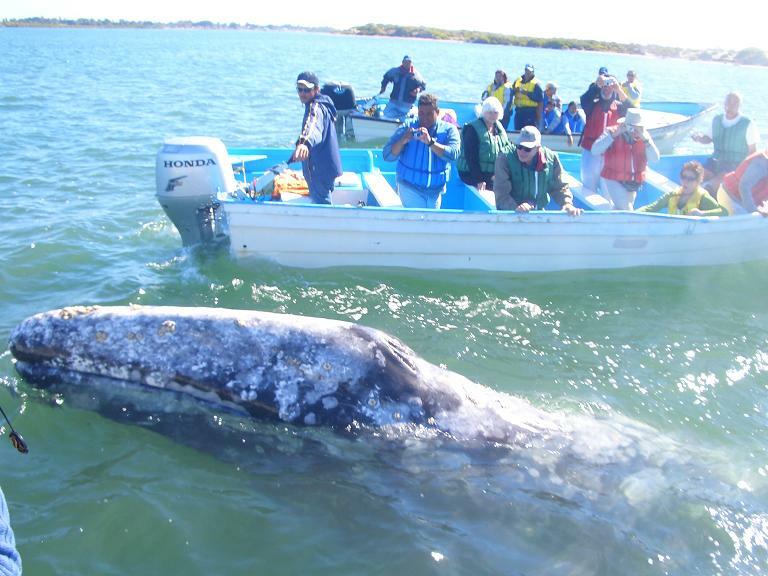 Come get up close and personal with an incredible experience for the the entire family in the calm waters of Magdalena Bay. We have complete packages to set up for you! It’s not too early to think about booking for 2018. We had a spectacular year this past season and lots of our anglers went right home and booked new dates for 2018. Dates are filling so let us know if you’re looking at visiting us next year or want a particular hotel or especially a particular captain! We also can put together gift packages as well. 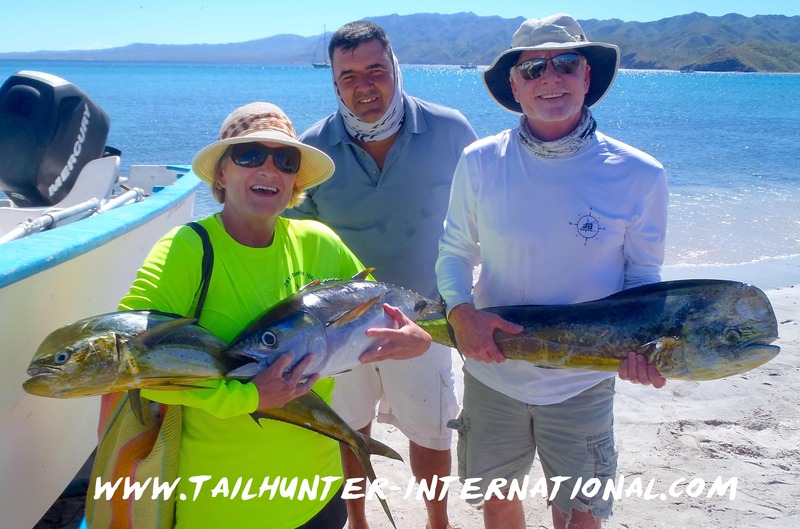 How about a gift certificate for a 2018 La Paz fishing trip with Tailhunter? Let us know! We’d love to have you visit. That’s our story! God bless you and your family for Thanksgiving! Best fishes! Weather – Sunny with highs in the high 80’s to low 90’s. Evenings very pleasant in the high 70’s to low 80’s. Some of us already are using sweatshirts and jackets and talking about blankets at night. (It’s all relative!). But is IS getting windier and windier with some days winds blowing double digits from the north. Water – It’s changing. As the winds blow more, the waters are getting greener and cooler. Half the days this past week the waves were too large to be out there fishing and we got pretty beat up out there. Fishing – Good when the winds didn’t blow. Catching – Same answer as above. Mike and Anne Hawks just had one day to get out with us recently come to La Paz from Phoenix, Arizona. 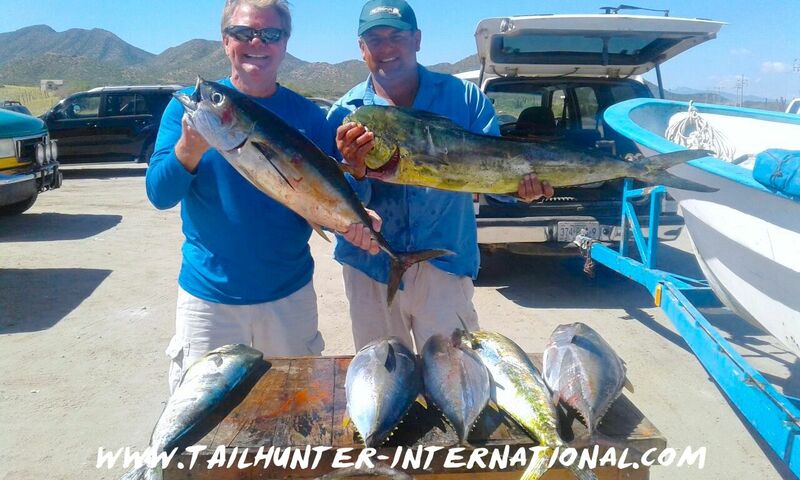 They were out with Captain Gerardo on one of the calmer days this week and got 2 tuna and 4 decent-sized dorado! Our good friend, John Ehlers, has already fished with us earlier in the year, but came back with his son, Cary, to fish with Captain Pancho. 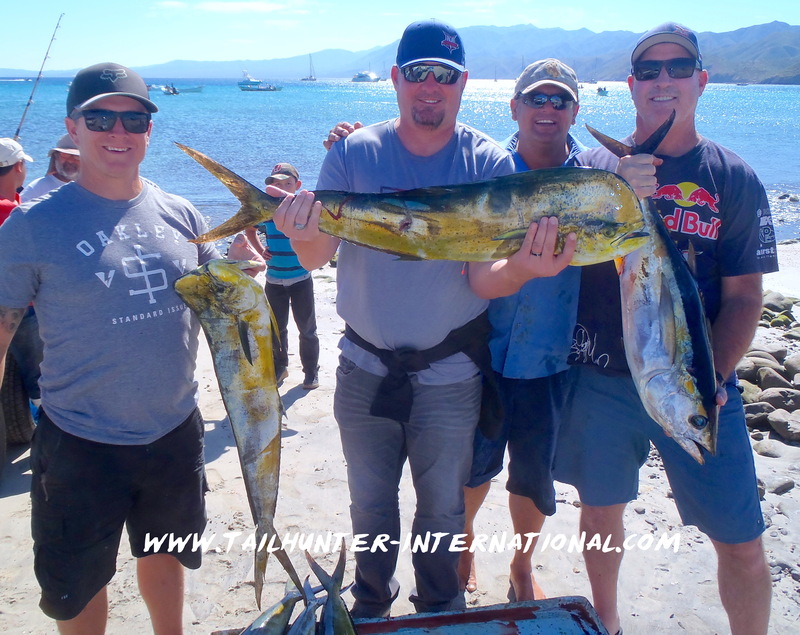 They had 2 good days and one crazy windy day, but started the week with a handful of tuna and dorado. They’re from Aurora, Colorado. From the Sacramento CA area, Wayne Kurahara shows off a couple of his yellowfin tuna. Pat and Bill were out late in the week and picked up two yellowfin. Their last day out with us, Cary and John Ehlers hang lots of dorado, releasing and giving away most of them and keeping a few for the ice chests. IT’S GETTING ROUGH OUT THERE! Basically, it’s bigger wind. Bigger waves. Fewer fishermen. Essentially, pretty typical for this time of year as we get closer to the holidays and the seasons change on us. 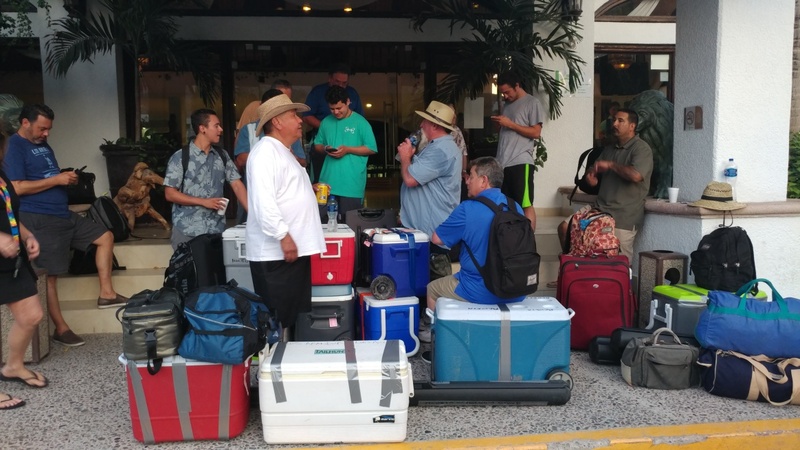 Mostly snowbirds starting to filter in from colder places in the world to enjoy some sunshine and not necessarily fishing plus racing teams starting to fill the town for the popular Baja 1000 race that hits La Paz this week. So, not a lot of fishing going on. When there is fishing, it’s all dependent on the weather right now. At least half the days this week weren’t even worth going out. Winds from the north are now pushing big swells into us and at times, even calm La Paz Bay is filled with little whitecaps or larger surges that throw spray onto the waterfront and passing cars. Even days when it seems not to be blowing, the surge and swell can still crash in and it’s just a miserable rough day to be out on the water…even if the sun is shining and it’s a pleasant 90 degrees! These are just days when it’s nicer to hang out on the beach or find some friendly cantina to pour a cold one and wrap your hand around a fish taco. We were personally out recently and one of the days we picked we headed to a spot we had just caught a mess of tuna and dorado. It took us over an hour just to get out’ve the bay going against the big swell! When we got to the spot of the SE end of Espirito Santo Island, the wind wasn’t blowing, but huge rollers pushed us around and beat us up and when the waves came up they were larger than the panga! So we retreated to fish back in the bay near Mogote and only managed two small dorado and a sierra. Even then, it was still howling! On the days when it’s calm enough and there’s no winds, there’s still some surprisingly decent fishing. Waters are definitely getting cooler and not quite as blue and a little more cloudy and green as the winds turn it up. 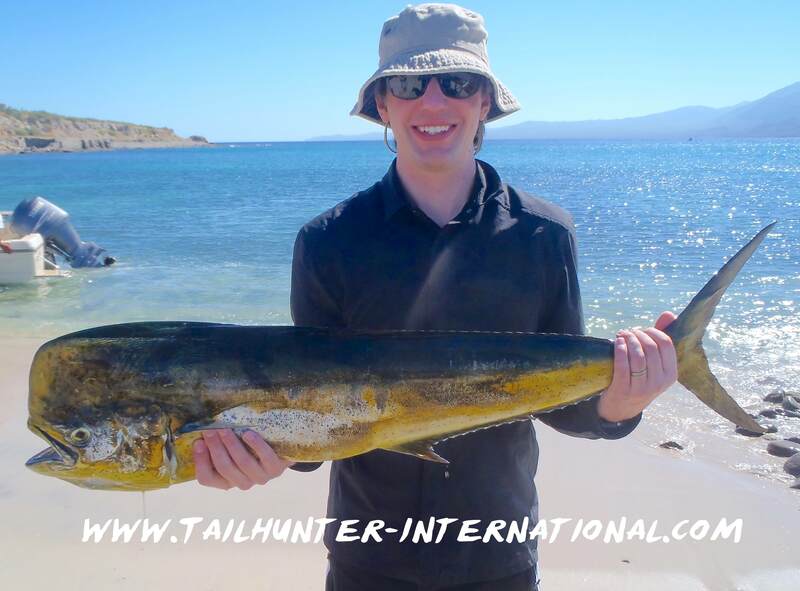 However, there’s still some spots of 10-20 pound tuna and some nice schools of dorado in varying sizes. However, with the cooler waters, we’re seeing more cooler water species like sierra, snapper, pargo, cabrilla, and amberjack. The bite is also directly related to having live bait. If it’s rough, it’s hard to get live bait and even the bait sellers aren’t out there knowing it’s futile so anglers are left to use dead bait, cut bait or find/ catch their own bait. Apologies for the sound quality this week. The wind was blowing pretty hard and I recorded it outside! Water – It’s changing and getting cooler, but I’m still registering 82 on the surface and went scuba diving this week and at 30 feet down it was 74 degrees. Waters are less blue and a little more green and cloudy from the winds in some places. 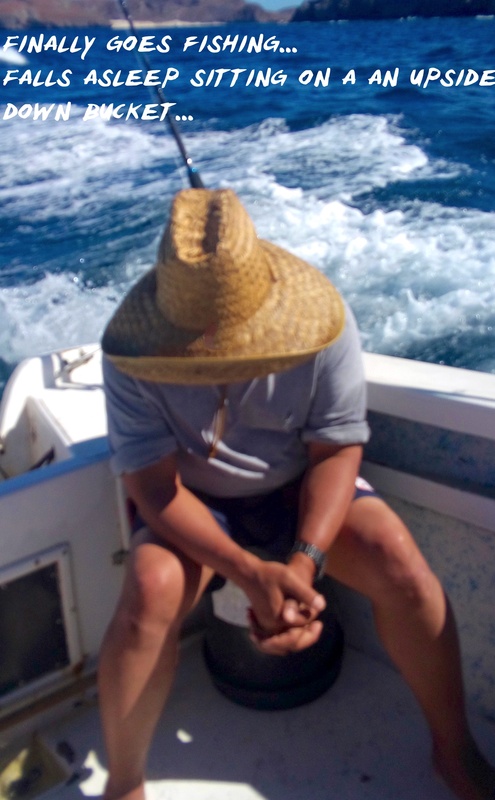 Fishing – When the winds don’t blow, it’s still pretty darned good. 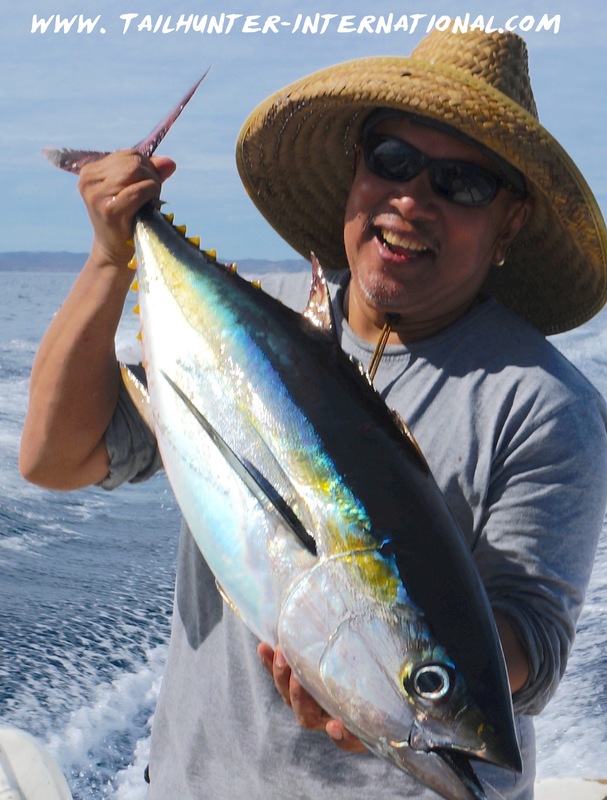 Tuna, wahoo, dorado still the main catches. Catching – Despite the full moon, everyone getting what they came for! He’s an ace! 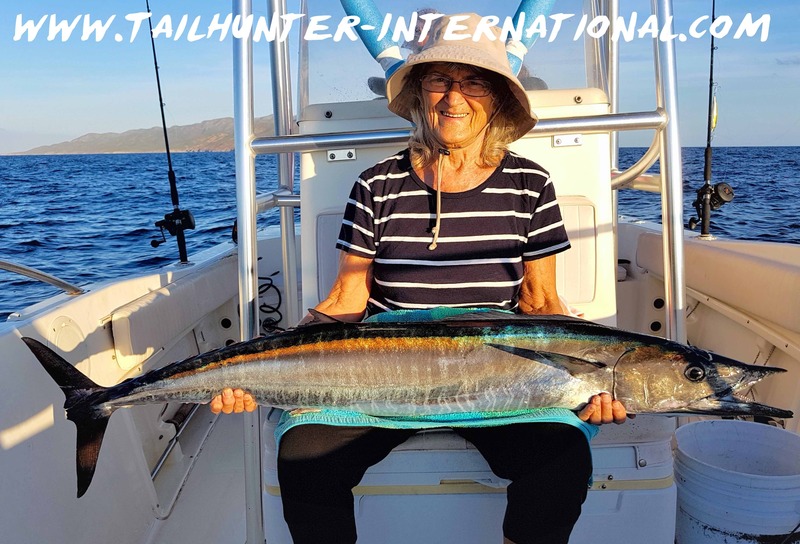 Roger Thompson and his wife, Donna (photo below) got 4 nice wahoo fishing with Captain Hugo off the south end of Cerralvo Island. Check out the nice size of this ‘hoo. The wahoo like the dark Rapalas. 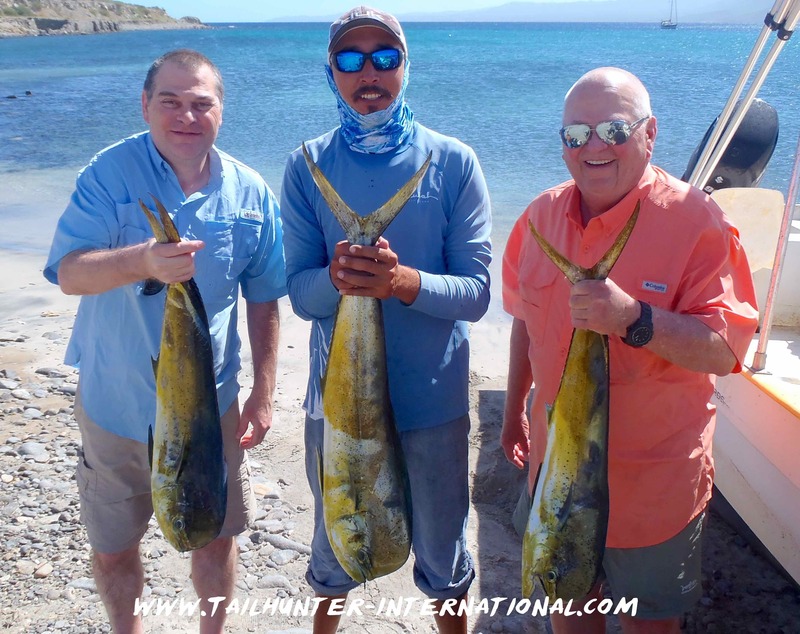 Two hours of fishing with Captain “ten more minutes” Chito, resulted in limits of dorado and 7 nice tuna for Jill and Jonathan at the SE end of Cerralvo Island. We could have easily had many more. All the fish was donated. Our Atlanta buddy, Leif Dover, squeezed in two quick days of fishing. Day one resulted in a box full of good quality dorado at the buoys off Bahia de los Muertos. He came to get his big rooster this year and Travis Millspaugh from Roy, Washington, hooked and released this quality fish just off the arroyo outside Bahia Muertos. Donna Thompson always gets quality fish! Nothing wrong with his quality wahoo across her lap! Yes, they even let me fish this week. Tuna going into the box. The guy still has game! 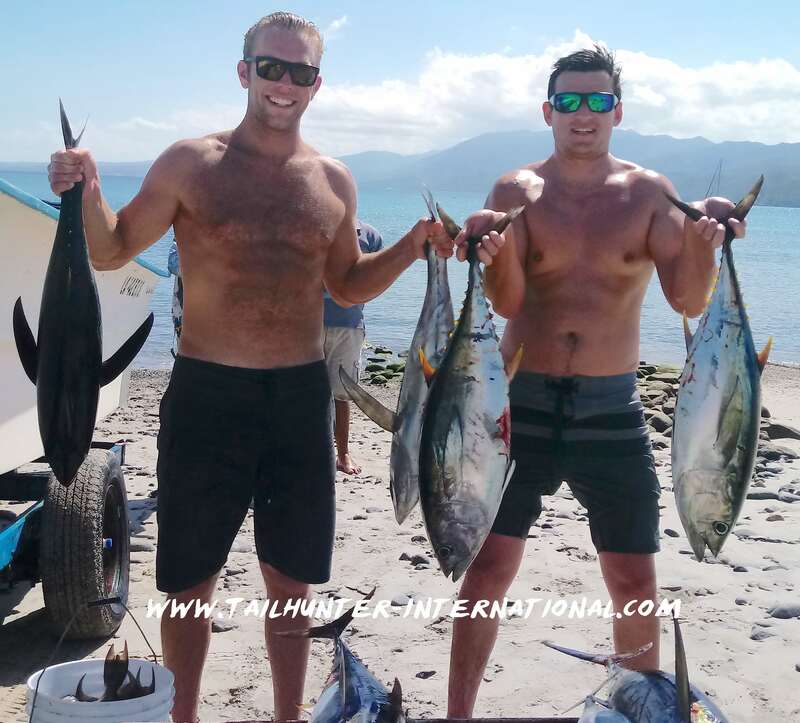 Just a quick one-day trip for Brandon and Nick from San Diego who passed through on a surf trip and took one day to fish resulting in a big box of yellowfin tuna. Day 2 for Leif Dover resulted in only 1 nice bull dorado…but 6 nice yellowfin tuna which is what he wanted. 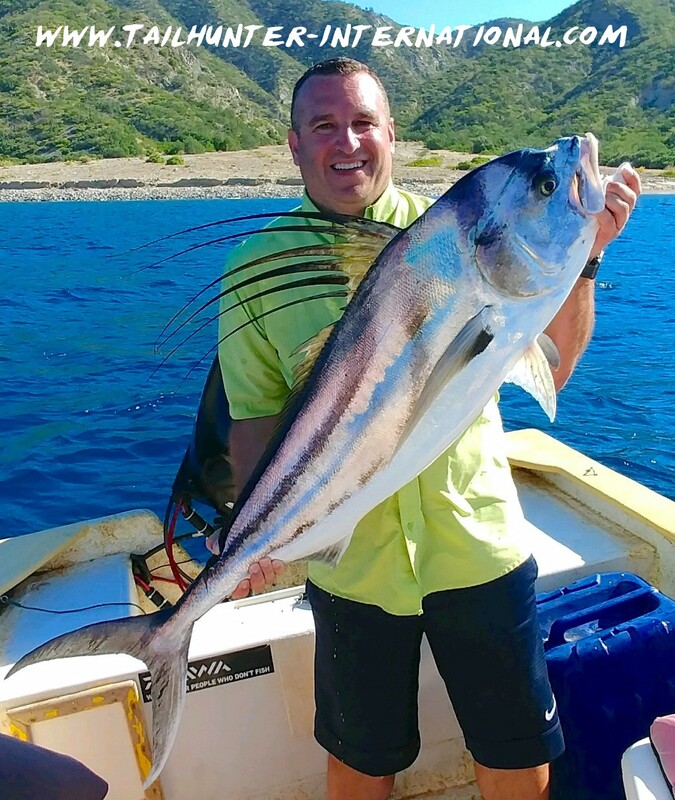 Nice mix of fish for Greg Scialampo and Captain Armando posing on the beach at Suenos with tuna and dorado headed to the ice chest! The full moon didn’t seem to do much to dampen the fishing down here. There’s just not that many folks fishing these days which is fairly typical as the holidays get closer; families are doing other things but also as northern winds start to blow here and make it a big rougher to be out on the water. Things are definitely changing as the breezes get stronger; waters get cooler and and the days are shorter. But, the fishing still remained strong…and not much traffic out there to get in the way! I was worried with more winds and if the full moon would affect things, but apparently not! I had thought that the massive tuna bite of the last few months was finally over as we had a lull in tuna the previous week. However, with a few exceptions, if you wanted tuna, they sure seemed to be there with legs 15-30 pound fish willing to bite live sardines, dead sardines, chunked bonito or lures. The south end of Cerralvo Island, Punta Perrico and then Castillo not far off the Punta Arenas lighthouse were all good spots to find the yellowfin. What’s really come on are the dorado. If you wanted the mahi-mahi, not only are they free-swimming around the bays and drop-offs, but just go to the shark buoys and there’s all the dorado you want. I had boats releasing 10-20 fish a day and some of them pretty decent size too! 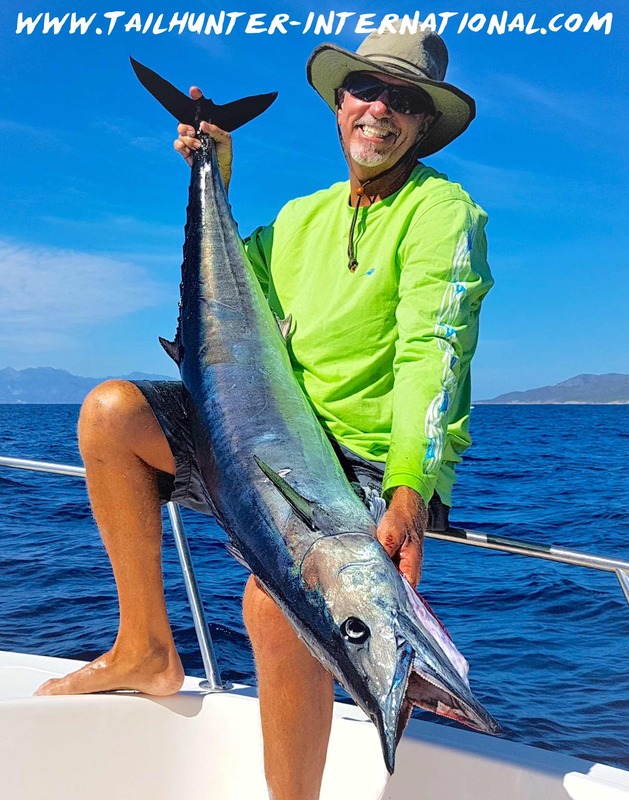 It was a case of easy limits then catch-and-release as much as you want for fun or go chase other species, especially wahoo that seem to get more active this week. Nice size ‘hoo at the south end of Cerralvo and near Punta Perico were willing to hit the dark-colored Rapalas but also hitting bait on wire with fish running 30-60 pounds. 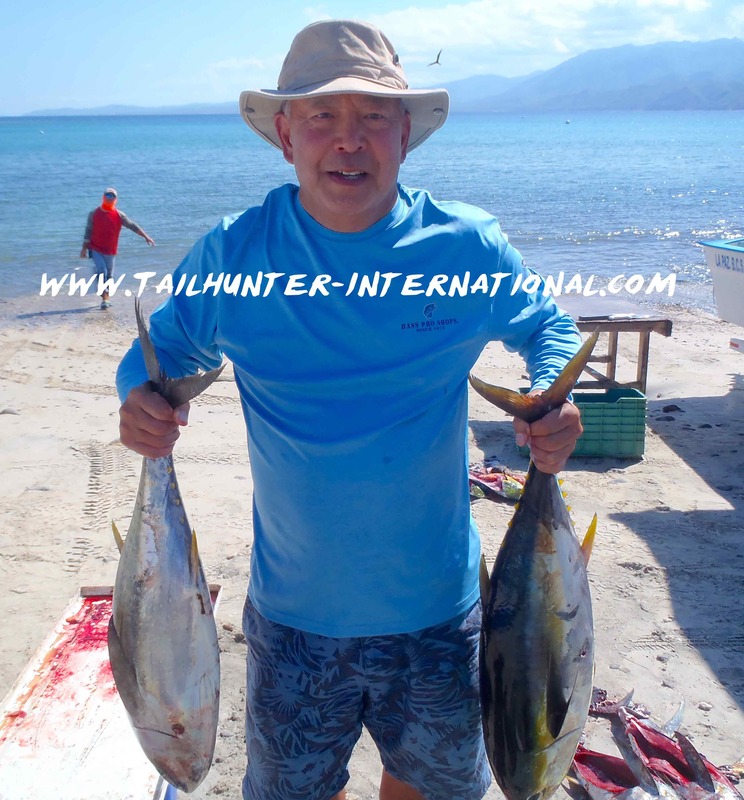 That area just east of Bonanza Beach near the south end of Espirito Santo Island held not only good number of dorado but for the last two weeks or so, several schools of 20-25 pound yellowfin tuna and wahoo as well. 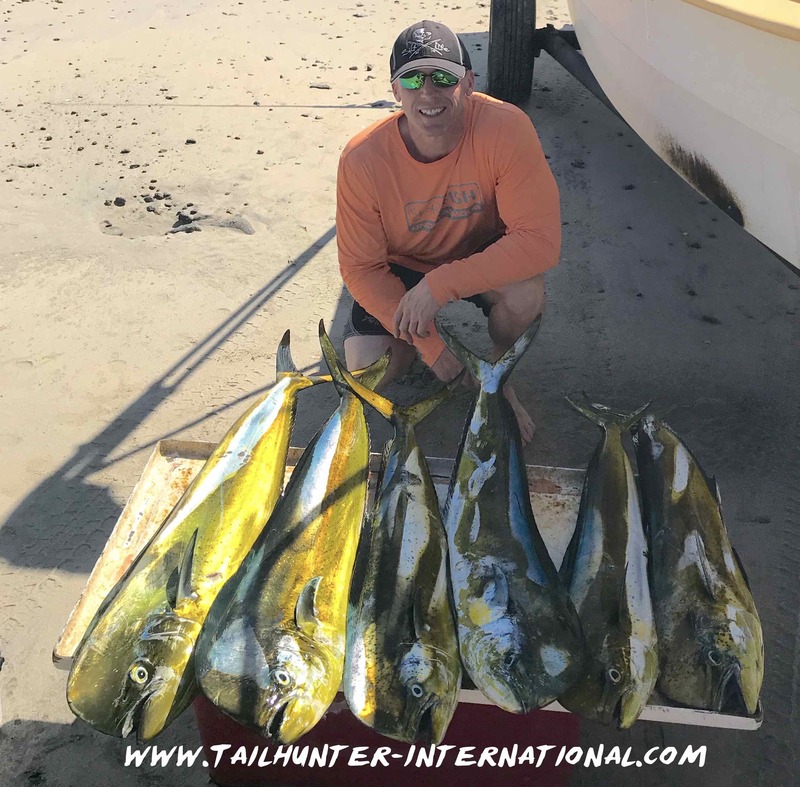 The fish are loving live and dead sardines and it wasn’t uncommon to get easy limits of dorado plus release a dozen more and catch a handful of nice yellowfin as well. Chunked and slow trolled bonito also worked well. Schools of foaming tuna like this haven’t been seen in years.